What Went Wrong on Montana's Alberton Gorge? Last Saturday, a woman on a rafting trip with her school drowned in the Alberton Gorge, an 11 mile stretch of class III+ whitewater on the Clark Fork River, in western Montana. The Gorge is a classic canyon run, with stunning scenery and exciting rapids. It�s one of the most floated stretches of river in the region and is considered to be relatively safe. Earlier that day, I called some friends to see if anyone wanted to join my friend John and me on an afternoon float down the Blackfoot River. The original plan was to row our rafts solo down the Alberton Gorge, but the river had come back up, and I was a bit uneasy about rowing boats with no other paddlers in them through the heaviest rapids in the middle of the Gorge, where a flip meant a long swim and likely a lost raft. The occasional swim while whitewater rafting is part of the fun - if you�re prepared and conditions are safe. This was John�s first float of the season, though, and we had no other boaters to join us, so I made the call to switch trips to the Blackfoot. It�s a gift, really, that we even have such options. Several hours and a sore shoulder later, John and I were back in town, happy and tired. While we were gone, two of the people I called, Matt and Chuck, had called back. Matt asked about a float down the Gorge tomorrow. 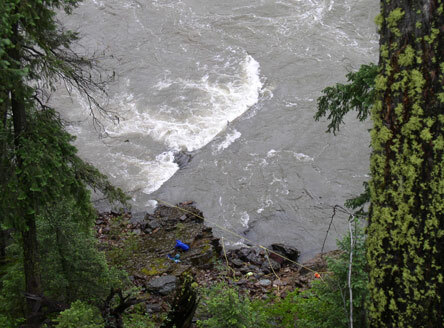 Chuck�s message said that he had heard that a nasty log had jammed between a rock and the bank at the bottom of Tumbleweed rapid, creating a "strainer" in the middle part of the Gorge, and that the float might be un-runnable. Spread the word, he said. I called Matt back to share the news of the strainer. He had heard nothing. An hour later, Matt called back. That strainer you told me about, he said, someone got caught in it this afternoon. Mike and Cody are out there right now, trying to retrieve the body. Matt�s voice was sullen, even more so than his normal tone. My heart sank as my head filled with the questions that Matt was trying to answer with the limited details he had. The woman who drowned last Saturday was swept under the log Chuck told me about, after she fell out of her boat in Tumbleweed rapid. She was an 18-year-old freshman from Eastern Washington University (EWU), on a trip with the school�s outdoor program. The classic line down Tumbleweed rapid is to start by paddling through the waves on the right side of the river, and then make your way to the left side, to avoid a large wave and recirculating hole about half way down the rapid. Once you miss the big feature, you must work against the current a bit, and move back to the center of the river, to avoid the pulsating currents along the left canyon wall. Executed properly, the ride is thrilling. A mishap, though, can end up with one or more people falling into the water. A swim can result in any number of possibilities, but most likely, banged knees and ankles, and maybe some swallowed water. On my hundreds of trips down that stretch, I�ve seen plenty of flips, swims and dumps there that turned out fine. In most cases, the swimmers actually enjoyed the thrill of the experience, but Tumblewed rapid is still a place that you really want to keep everyone in the boat. Matt and I guide for a Missoula whitewater outfitter, owned by Mike Johnston and his wife Bernice, and which runs trips on the Alberton Gorge. Cody works for them, too. The day before the accident, Mike, Cody and some guides in Mike�s swiftwater rescue class saw the log lodged in the river in the pulsating currents at the bottom left side of the rapid. The three-foot diameter log sat just at the surface, making it all but impossible to see until you were almost on top of it. One of the guides, who was purposefully swimming the rapid with a riverboard, actually floated into it, and stuck just long enough to give Mike pause about taking customers down the river. After a group of guides worked unsuccessfully to pull the log out of the current later that evening, Mike made the call to cancel Saturday's trips, and he and Cody alerted all of the other companies and Fish, Wildlife and Parks about the hazard. David�s three-boat group was ahead of the EWU group. Sometime around noon on Saturday, he and his other two boats pulled into the calm water above Tumbleweed to warn their clients about the hazard. David took his boat through first. As he was heading down the river, the EWU crew came up from behind, and the other two guides decided to let them float by. Washington. D.C. - Montana Senator Conrad Burns today announced that his Missoula Field Representative, Larry Anderson, will hold community outreach hours in both St. Regis and Superior on Thursday, June 8. Mark your calendars for June 10 when Alberton Feed & Supply celebrates its first anniversary. Callison Trucking and Excavating, already in business for one year, will also be celebrating its move to the new office located in Alberton Feed & Supply at 201 Railroad Avenue. Stephanie Janelle Pruitt of St. Regis won the 2006 Mineral County Community Foundation scholarship. The foundation selects the winner based on community involvement and academic achievement. Congratulations Janelle! The scholarship rotates among the three school districts of the County � a senior from Alberton High School will be the recipient of the 2007 scholarship. Contact Committee Chair, Herman Berneking, for further details. (Missoula)--Make a little room on the trophy case Superior. Lady Bobcat JaNece Godin defeated Amber Keil of Conrad in straight sets, 6-4, 6-0 for a 2-0 win at the Class B-C state tennis tournament, earning herself the singles state title Saturday afternoon at the University of Montana in Missoula. St. Regis 1st Annual Talent Show!